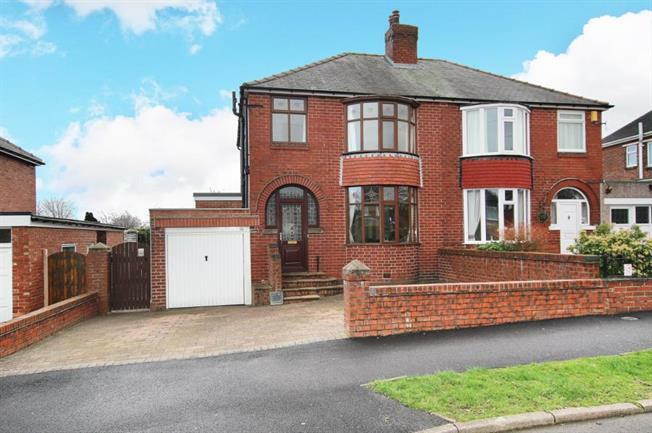 3 Bedroom Semi Detached House For Sale in Sheffield for Guide Price £175,000. Located within this popular residential area and having the benefit of a good sized southerly facing garden is this well presented three bedroom semi-detached property. The house offers gas central heating and double glazing and offers no upward chain. The accommodation comprises, entrance hallway, bay windowed lounge, dining room, extended kitchen with access to the rear, three bedrooms to the first floor with family bathroom. To the front is a substantial block paved area allowing space for at least two vehicles and access to the garage. The main feature to this property is the size of the rear south facing garden which has an attractive stone patio, range of useful borders with mainly laid to lawn area. The location is popular as its close to local shops, supermarkets and is within close access to local transport and good reputable schools. An early inspection is recommended strictly by appointment through the selling agent Blundells.